I love historical fiction. One thing that will make me love a book of this genre is when the story has so many details that I read with a pad and pen. I need to look some of this information up to find out if it is truth or just told so well it feels like truth. The story is set during the 1920's. Women have had the vote for a while. Now they have stepped out to try to find their place in the world. We find two women stepping into a world that is dominated by me. 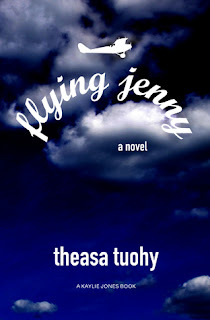 Jenny is a pilot who loves the freedom of flying for the fun of it. Women have begun to step into the pilot's seat for different types of challenges, endurance and speed challenges as well as stunt flying. Laura is a reporter in New York. Due to her bohemian background, she has had to find her own way in the world since she was a small child. She meets Jenny while covering a story where a pilot is going to fly under the major bridges in New York City. That is when Laura realizes the pilot is a woman. There worlds collide in many ways. I felt more like I was reading a biography than a historical fiction book. The whole thing was so well written I felt like I was a third character in the book just observing. I had not heard of this author before. I will definitely look for more by them. A very interesting book that I would recommend.